But then one day I stumbled on an ad in Artweek for an editorial assistant opening at the Friends of Photography, a nonprofit organization that Ansel founded in 1967 to present exhibitions, publications, and educational workshops in fine art photography. Jobs like that didn’t come around often. From my vantage point as a student, a paying job of any sort in the arts seemed a rarity, but one with a living legend was unimaginable. And yet, here I was, working for the man who wrote the rule book on photography. Ansel is famous for having invented the Zone System, a mechanical process for reading light and exposing and developing black-and-white photographs. He published several definitive volumes on photographic techniques—depth of field, the use of filters, and the chemistry of film processing. In Albuquerque, we referred to Ansel and his peers, with some superiority, as the “rocks and roots” school of photography. Such hubris. As if we were capable of producing anything that could begin to match Ansel’s visual elegance and technical proficiency. Ha! 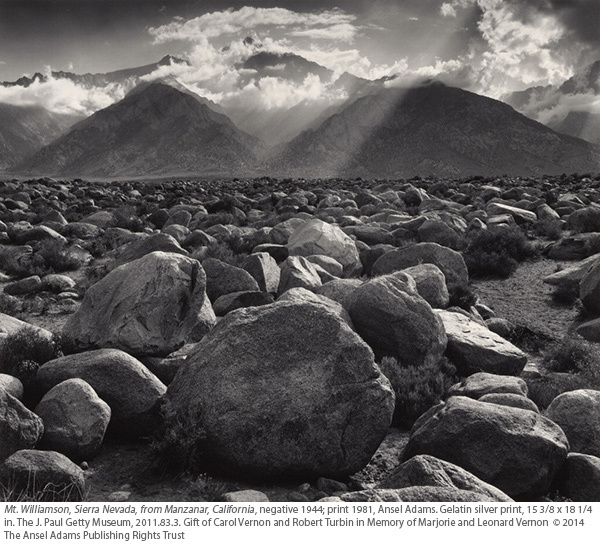 A collection of Ansel’s exquisitely meticulous photographs is on view now until July 20 at the Getty Center. 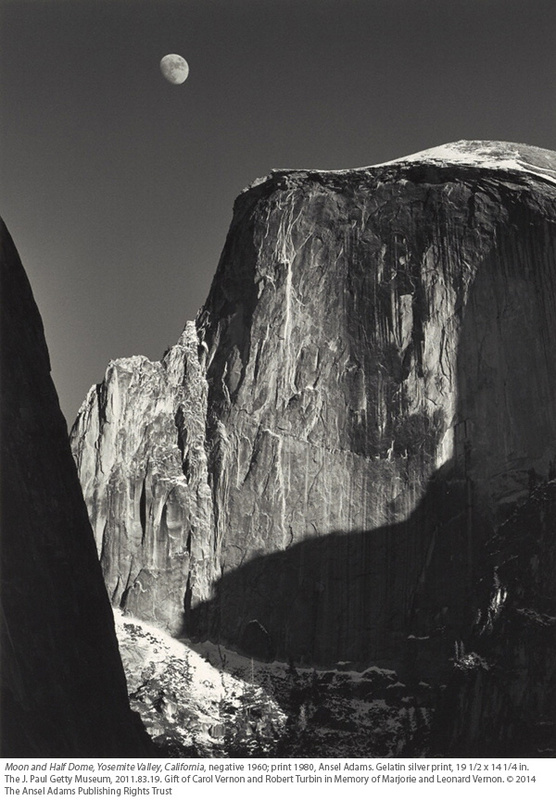 “In Focus: Ansel Adams” includes prints that were originally purchased by Leonard and Marjorie Vernon, prominent collectors who played an important role in the stewardship of the Friends of Photography. Their daughter, Carol Vernon, and her husband, Robert Turbin, recently donated the set to the Getty. I spent three-plus years at the Friends. I don’t know whether the half-dozen of us 20-somethings on staff were seen as energetic minds, cheap labor, or both. In any case, it proved to be a work-hard, play-hard chapter in all of our lives, filled with gallery openings, workshops, the publishing of monographs, and visits from a constant stream of famous people. I learned as much about gallery lighting as I did about book publishing and archival print handling. All this will be on my mind when I gather with other museum visitors to gaze at the impossibly perfect images of “Moon and Half Dome” or “Dogwood Blossoms in Yosemite National Park” at the Getty. I will think of Ansel’s articulate, statesmanly defense of our natural resources. I will think of his alchemy in the darkroom, teasing silver gelatin into an exquisite luminescence. I will think of him holding court in his living room, telling the story of how he captured the sun streaking over those boulders at Mt. Williamson, in Manzanar. And I will revel in the memory of being a young person in Ansel’s orbit during that heady time. We learned from Ansel the importance of looking closely, very closely, at the world. And, though few of us would get it right, that preserving the wonder and beauty around us is a worthy goal, and in its way, a sacred pursuit. *Photos by Ansel Adams courtesy of the Getty. 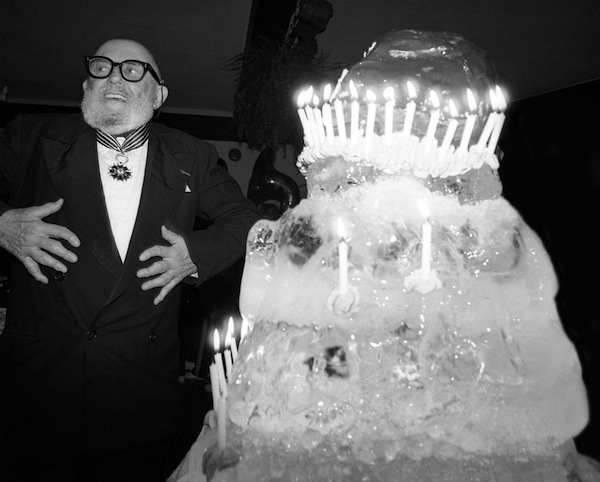 Photo of Ansel Adams at his 80th birthday copyright Jim Alinder.